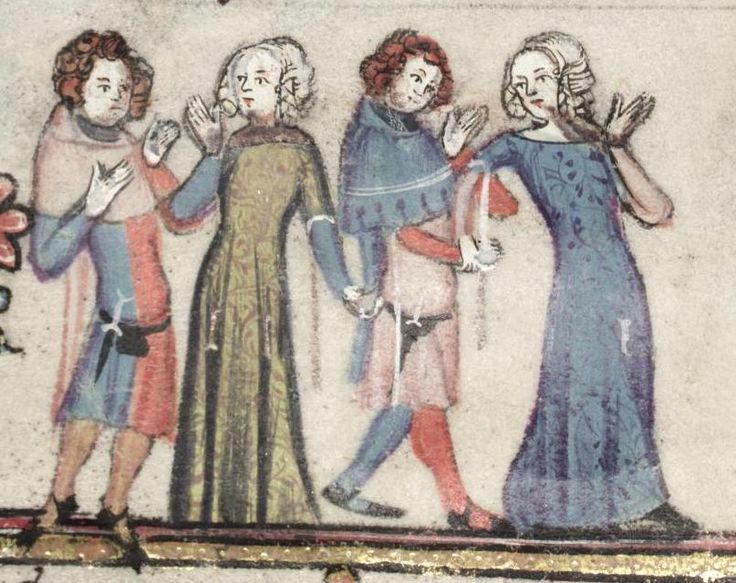 Men and women dancing from Romance of Alexander. MS Bodleian 264, c. 1338-44 France. Woman and her chaperone meeting a man. University of Chicago MS 1380, c. 1350, France. The sources I’ve listed show how contemporary people presented themselves. These are considered primary sources for their clothing. Secondary sources, which we’ll look at next post, might be images redrawn from these sources, or descriptions of these fashions written later. To give some art historical context, here is this century and place on the Metropolitan Museum of Art’s Heilbrunn Timeline of Art History. There are a couple of popular medieval books which were illustrated with people from different classes and jobs. We are lucky enough to have them available electronically. Woman herding geese from the Smithfield Decretals. British Library, c. 1380 (illustrations), England. One of this is in the collection of the British Library in London, UK. 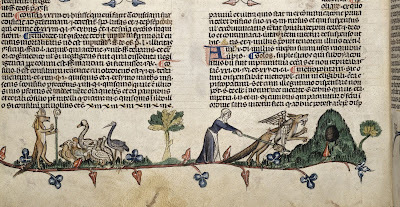 This is known as the Smithfield Decretals. This collection of documents was calligraphed in France, c. 1340. However, the owner took it back to England with him. Around 1380 he commissioned artists to decorate its pages with scenes of everyday life. Each page has colorful illustrations of things like people baking bread or taking wheat to a miller. Another great manuscript source is the Romance of Alexander, the source of the picture of couples dancing at the top of this article. The Bodleian Library, which owns the manuscript, has digitized it so you can click through it here. Scene from medieval poem Roman de la Rose. Biblioteque Nationale, c. 1350, France. Finally, the best selling poem of the middle ages, Le Roman de la Rose, a surreal exploration of the psychology of love, was illustrated in hundreds of beautiful books between it’s publication c. 1230 and 1500. Many of these were illuminated between 1340 and 1400. Because the story remains the same, it is easy to observe changes in fashion on the same characters over successive copies of the popular work. Manuscript libraries have collaborated to digitize many of these, which you can view here. Ivory mirror case showing noble couple hunting with falcons. Metropolitan Museum of Art, c. 1350-60, French. Another source for fashionable clothing are the accessories (often holders for small personal mirrors) that were popular 14th century gifts. The Metropolitan Museum of Art in NYC has several wonderful examples of these. 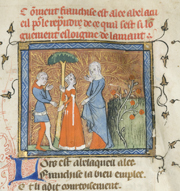 This one depicts a noble couple out hunting, with a servant or chaperone, probably a scene from Le Roman de la Rose. Here, the gentleman sports a tall fashionable hat while his girlfriend wears a gown with hanging oversleeves. Aquamanile in shape of Aristotle being ridden by his lover Phyllis. Metropolitan Museum of Art, c. 1450-1510, Netherlands. This source is a fancy water pitcher made of bronze, also in the collection of the Metropolitan Museum of Art. Note the detail on the woman’s round edged hanging sleeves (called tippets) and the large sleeves and buttons on Aristotle’s fashionable jacket. This “aquamanile” shows the popular story of Aristotle being treated like a beast of burden by Phyllis, the beautiful young lover of his student Alexander the Great. This story was popular with medieval Europeans, so it was recreated a lot. The characters were often depicted wearing high fashion. In this case, the item shows the high fashion of 50 years before the object was made. Effigy bust of Princess Marie de France. Metropolitan Museum of Art, c. 1381, France. The Metropolitan Museum of Art is a wonderful place to wander around and look for fashion details. One of my favorite statues is this bust of a French princess, Marie de France. It was carved around 1381, as the sculpture that was put on top of her tomb at the Abbey of Saint-Denis. I love that the details of her braided hairdo are clear. A shift is a woman’s long linen undershirt. Her blanchet was a cloth that was possibly a cloak, and possibly part of her draped headwear. Her cotte was her main dress. Her surcotte an over dress, sometimes with sleeves, sometimes without. Her wimple was the draped veiling that went under her chin. We have lots of dictionaries for fashion terms in the library, too. Happy researching! I’ll be talking about secondary sources for fashion history soon! This talk features an FIT author! Professor Sharon Rothman will be here to talk about her new book, The Fashion Designer’s Sketchbook. In it, Rothman discusses 4 different types of creative journals, each of which feeds the author’s work at a different stage in the development of a fashion line. Her techniques offer new ways to generate design ideas so the sketcher can keep new projects fresh and creative. Professor Rothman will present her ideas on Wednesday, April 3, 2019 from 5:00-6:00pm on the 4th floor of the FIT Library, room 435. This is a Love Your Library event.